The Institute for Vibrant Living is a top provider of nutritional supplements that are created with extensive research and the support of several medical doctors. IVL Products has been certified by the FDA to have manufactured all products with Good Manufacturing Practices (GMP) with a 100% money-back guarantee return policy. 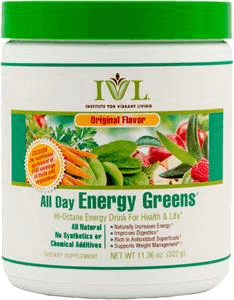 Packed with natural energy boosters and green super-foods, All Day Energy Greens is the equivalent to taking a healthy complex mix of veggies in a single sitting. Available in an organic blend, tasty fruity Zing, and a combo pack with Go Ruby Go! 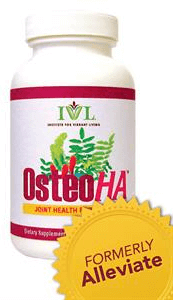 OsteoHA has been developed to work by helping lubricate joints with promoting synovial fluid, which is naturally found inside joints that is directly responsible for the life of your joints. Natural herbs along with with hyaluronic acid (HA) may deliver hydration back to your joints. 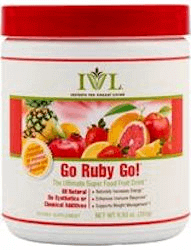 Help fuel your day with Go Ruby Go!, the great-tasting fruit powder superfood supplement that packs a punch. Made with concentrated natural fruit extracts, the benefits of this supplement extend beyond a simple energy boost. Gluco-Harmony all-natural supplement contains 9 Ayurvedic botanical extracts which may help stabilize "sugar spikes" in the blood and prevent insulin resistance. Another benefit of this blend is after meals, it may reduce sugar cravings. 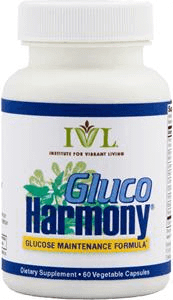 Start taking control of your blood sugar levels with the support of Gluco-Harmony. 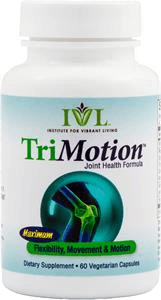 TriMotion is an herbal supplement designed to target joint pain, stiffness, and overall discomfort with scientifically-studied ingredients yielding promising results. Featuring a blend of herbs with, Hyaluronic Acid (HA), and other joint-soothing ingredients shown to improve flexibility and reduce pain. Reconnect is designed to improve hearing, reduce annoying ringing in your ears and to promote balance. This supplement blends amino acids and other vitamins and minerals to work to suppress the damage caused by free radicals, helping you maintain your hearing health. Help support your joints with 19 hand-picked ingredients that enhance joint health and may relieve the everyday discomfort caused by stiff, achy joints with Flex-19. This herbal blend targets the joints and helps address common aches and pains that lead to decreased joint function. Enjoy the astonishing benefits of green tea without needing to drink a single cup of tea. especially formulated to be a super concentrated healing remedy, IVL’s Green Tea Elixir only requires two drops to get the same benefits as one full cup of tea. Green tea is loaded with powerful antioxidants that may help support your immune system, keeping you healthy and well. 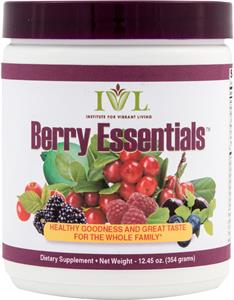 Berry Essentials drink mix includes many disease fighting antioxidants packed into a great flavored drink that everyone can enjoy. 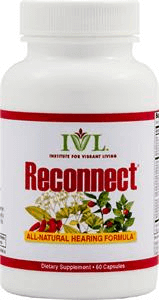 This supplement is filled with a variety of berries offering a flavorful thirst-quenching drink that provides many nutrients that may help to fight diseases. Take charge of your heart health when you take Natto BP Plus, a supplement designed to help you maintain a healthy blood pressure. With a unique blend of five vitamins and minerals, this supplement works to help reduce oxidation, relax constricted blood vessels, and strengthen capillaries. 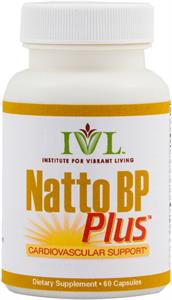 Natto BP Plus helps allow your heart to work more efficiently to move blood through the body, reducing strain. If hair loss is a problem for you, then SeaNU Hair may be just what you’re looking for. Rather than focusing on the cosmetic aspect of hair growth, SeaNU focuses on promoting hair growth from within. 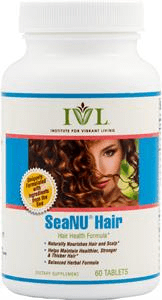 The nutrients in the SeaNU formula include all of the most widely studied nutrients known to help promote hair growth. The vitamins in this formula provide anti-aging super nutrients such as zinc to stimulate the production of Keratin, which is the primary component in skin and hair. 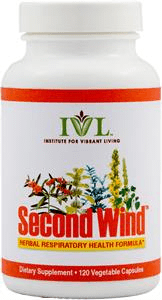 Second Wind is a natural supplement for anyone who has been suffering with seasonal or ongoing lung problems. This supplement can help fight off colds, help ease breathing problems, clear the buildup of mucus and clear chest congestion. Second Wind is comprised of nine all-natural ingredients that is designed to help repair and protect your respiratory system. Eyes weaken as result of the natural aging process and by years of oxidative stress including deterioration of optic blood vessels, nerve tissues and retinal cells. 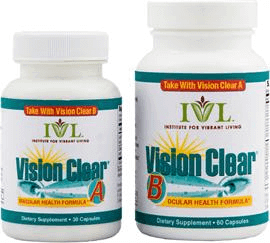 Vision Clear is a natural supplement scientifically developed to combat vision damage, lessen symptoms of eyestrain and overall improve your eyes health. Vision Clear can offer unparalleled nutritional support for overall eye health and reverse years of damage by feeding the body with high-potency antioxidants, vitamins, and more. Improve your body's digestion with the high-fiber grain barley. This supplement will help keep you regular and may also reduce painful acid indigestion. 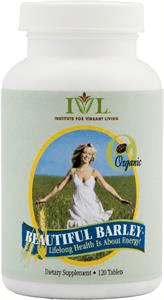 The blend of ingredients found in Organic Beautiful Barley may also improve bones and joint function as well as building lean muscle mass.